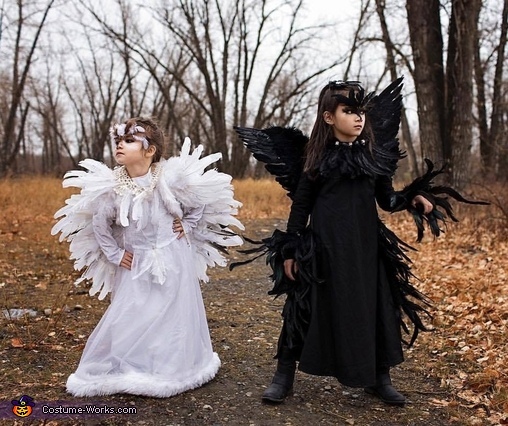 My 4 year old is dressed as a snowy owl and my 7 year old is dressed up as a black crow. Both dresses were purchased second hand ($5 each). Originally the white dress is a princess dress and the black dress is a Star Wars Kyle Ren costume. The wings came from other costumes in the past. The white wing was an angel wing and I removed the feathers and rearranged them to look more bird-like and added more feathers (purchased at a dollar store). I sewed and glue feathers to both dresses. Both costumes cost under $25.